The claim that these rocks contain remnants of life now faces intense scrutiny from other scientists, but if the research stands up, it suggests that the first organisms to emerge on Earth did so during one of the most violent periods in the planet’s history. 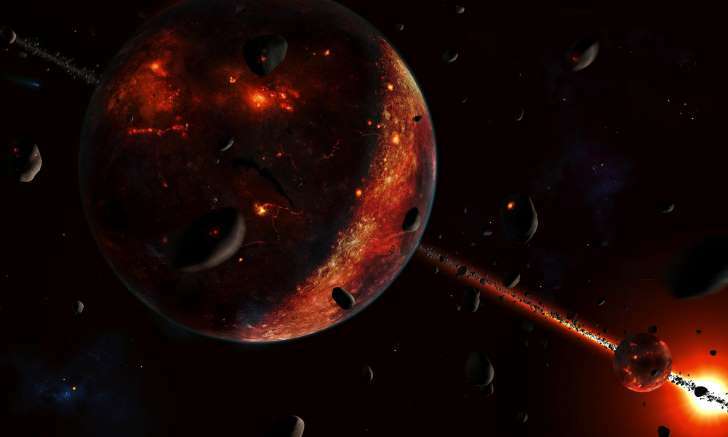 Until 3.8bn years ago, the Earth was pounded by asteroids and comets left over from the formation of the solar system. “There may be a lot of people who are not convinced because their conclusions are based on one line of evidence,” said Matthew Dodd, a PhD student and geochemist at University College London. Earlier this year Dodd and his supervisor, Dominic Papineau, reported what might be the world’s oldest fossils from nearby rock formations in Canada. Dodd said he agreed with the Japanese team’s findings, but said the results might be more convincing if the scientists had gathered more evidence to support their claim. Other scientists have more serious concerns. Martin Whitehouse, at the Swedish Museum of Natural History, doubts that the graphite is so old. The date of the rocks in the region is based on measurements of tiny particles of a mineral called zircon. But Whitehouse says the scientists used the oldest age from zircon that was kilometres away from where many of the graphite samples came from. “Regardless of the veracity of the biogenic evidence from the graphite, the claim that it is the oldest requires that the geochronology is watertight. If it’s younger than about 3.8bn years, it isn’t very exciting anymore.” He added: “I would say this fails the first test of proving an oldest anything in a region where igneous rocks have a range of ages between 3.9 and 3.7bn years old.” Minik Rosing, a geologist at the Natural History Museum of Denmark, also questioned the age of the graphite. “The problem is, they assign this very old age to everything,” he said. If the work does hold up to further scrutiny, it will mark a milestone in scientists’ understanding of the earliest life on Earth. The oceans are thought to have formed 4.3bn years ago. If life gained a foothold 4bn years ago, it leaves a narrow window, by geological standards, for life to emerge. According to Sano, similar tests could be used to identify the types of microbes that left the graphite behind, and even find evidence for life elsewhere. “If we have a suitable sample, such as a fresh Martian meteorite, we may discuss life on Mars,” he said.